Walk in a winter wonderland a thousand metres above the city at Grouse’s annual holiday celebration, Peak of Christmas. The festivities include Santa’s workshop, an 8,000-square-foot outdoor skating pond, real reindeer, sleigh rides, Christmas choirs – all set against an alpine backdrop. The Peak of Christmas is in included in the price of an Alpine Experience Ticket ($39.95 for adults, $35.95 for seniors, $23.95 for youth 13-18, $13.95 for children 5-12). Come on, it’s lovely weather for a train ride together. Parents of small kiddos consider Bright Nights to be one of the most enjoyable Vancouver holiday traditions. But make no mistake, grown-ups will melt like Frosty in summer over the view of 2 million twinkly lights illuminating Vancouver’s 1000-acre Stanley Park, visible as you ride the park’s Mini Train. Don’t forget to finish with cocoa, roasted nuts, and Christmas carols in the plaza. Rides run 3 p.m. – 10 p.m. (11 p.m. on Fridays and Saturdays). Afternoon matinees run Wednesday, Saturday and Sunday 11 a.m. – 3 p.m. It’s closed on Christmas. Adults are $10, children and seniors are $7. Matinee train tickets are $5.50. Tenor Ben Heppner brings classical Christmas to the Orpheum. The colourful Saint Nicolas cantata by Benjamin Britten tells the stories of the real saint using choir and orchestra. The companion piece for this joyous holiday concert is a rousing rendition ofGloria by Vivaldi. Tickets start at $10. Can’t make this show? Check out VCC’s otherChristmas concerts including A Dylan Thomas Christmas. You better watch out. You better not cry. You better not pout. I’m telling you why: Santa Claus really is coming to town. While Vancouver is a brunch kind of place, Kris Kringle can only make it for breakfast. He gets pretty busy around this time of year, if you can imagine. Join Santa for a nosh from 9am-11am on Grouse Mountain. Breakfast includes a sing-a-long, reindeer crafts and admission to Peak of Christmas. Tickets are $49.50 for adults, $29.90 for youth (13-18), $18.40 for children (5-12). 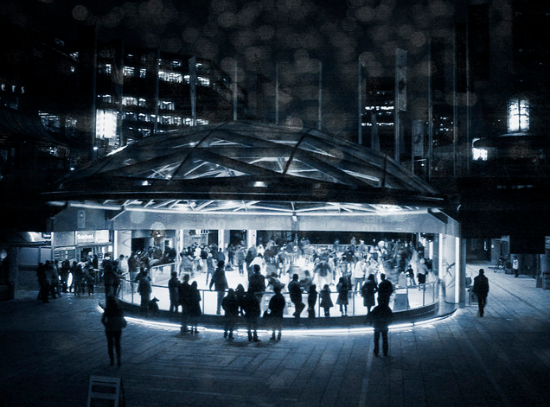 5) Free Ice Skating at Robson Square Ice Rink, ongoing through Feb. It doesn’t quite feel like the holiday season until you can stroll by Robson Square in the heart of downtown Vancouver and see ice skaters. The best part about this festive, family-friendly Vancouver winter tradition? It’s free. While visitors in NYC have to pony up $19 to skate at the iconic Rockefeller Center Ice Rink, and it’s $20+ to skate the Natural History Museum Rink in London, Vancouver’s Robson Square Ice Rink only charges for rentals. And at $4 (cash) for blades, it’s really not steep. Vancouver’s award-winning botanical garden transforms into sparkly eye candy every year as gardeners deck the boughs with thousands of strings of coloured lights. The big draw is the enthralling “Dancing Lights” on Livingstone Lake, which burst into action every 30 minutes. Kids can also meet Santa in his living room, and high five Svend and Jens, the Scandie Christmas gnomes. Dec. 7 – Jan. 1, 4:30 p.m. – 9 p.m. Closed Christmas. Adult $14.25; Senior and Youth $10.50; Child $7.75. ArtsClub Theatre Company presents this beloved holiday classic with a new roster of crooners that do Bing justice. Based on the classic film, this tap-dancing delight is full of festive tunes: “Blue Skies,” “Sisters,” and the ever-popular “White Christmas”— that will fill you with the spirit of the season. The play runs at Stanley Theatre (2750 Granville St.). Tix range from $25 to $74. The holidays Vancouver Christmas Market-style are romantic, aromatic and twinkly. 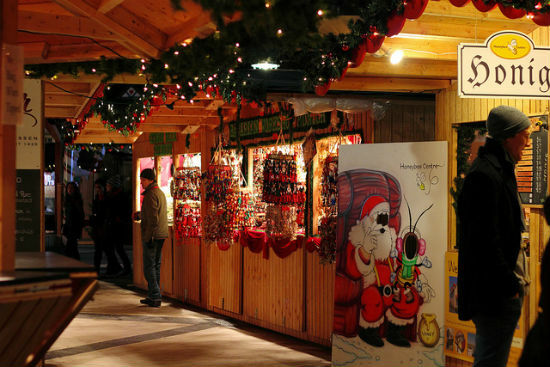 Stroll inside the village gate into a world of rustic wooden huts surrounding a soaring Tannenbaum. Partake in Glühwein, brats, stollen, and gingerbread. Browse Christmas decor and gifts. Kids will enjoy the old fashioned carousel, gingerbread decorating at the Kids Centre. The market is in Queen Elizabeth Sq. Plaza in downtown Van. Tickets are $5 for adults, except weekdays 11am-4pm, when it drops to $2. Youth (7-12) are $2. Kids (0-6) are free. For many, attending the Nutcracker is an irresistible annual holiday tradition that began when their kids danced in it. Join Clara on her adventures with princes, sugarplum fairies, evil rat kings and cossacks. In the Royal Winnipeg Ballet version, you may recognize iconic Canadian imagery (a snowy hockey game and a battle on Parliament Hill) in Clara’s fantasy land. Tickets start at $30.25. Perhaps the most creative display of lights this holiday season, Vancouver Aquarium has put together an aquatic light show featuring the incredible world of fluorescent and bioluminescent ocean light. Find out why and how aquatic animals like anemones, cuttlefish, jellies and corals glow in the deep. Don’t go home without a meet-and-greet with Scuba Claus – underwater Santa. The show is included with the price of admission: $21 for adults; $16 for youth 13-18, students and seniors; and $13 for children 4-12. This lovely cavalcade of rainbow stars is a free Christmas attraction you can spot riding buses that run across Burrard Bridge. Every year, Vancouver’s downtown hospital is decked out in 10 kilometres (that’s seawall length) of Christmas lights. The volunteer-built display aims to inspire hospital donations. Have yourself a merry little Christmas. Let your heart be light as you join a floating parade of 50 decorated boats on a nightly excursion through Vancouver waters including Inner Harbour, Outer Harbour and False Creek to as far as West Vancouver, Port Moody and Deep Cove. Vancouver’s cruise ship companies offer many tpes of holiday adventures that offer dinner, carols and dancing. Participate in old school winter traditions by celebrating the return of light after the Winter Solstice – the shortest day of the year. This romantic community event takes place across five Vancouver neighbourhoods including Chinatown, Granville Island and Yaletown. As the name suggests, illumination comes from lantern displays, not bulbs. And it’s free! Learn more here. Outside the snow is falling and friends are calling, “Yoo hoo” from the stunning, 137-metre long suspension bridge that swings 70 metres above the Capilano River. While the bridge is always a jaw-dropper, it’s exponentially more magical when it’s decked out in twinkly white Christmas lights. There’s also a scavenger hunt, gingerbread cookie decorating and sing-along carols. Open daily 4pm. – 9pm It’s closed Christmas. Adults are $31.95, children are $12, and it’s $65 per family (2 adults and 2 kids).